It is always tough to pass condolences to a grieving family without sounding trite, but I sent a brief note to John's son this afternoon and received the following reply. I don't think Louis would mind if I shared it with YOGWF. My Dad just lived for his interactions on the various web boards. Occasionally he would tell me a story about someone on the board but for the most part, I never knew much about them. In the last few days of my father's illness and death where I've taken on the task of notifying his friends, I've come to see how many special relationships he had developed over the years. I'm grateful for them because I know that it gave him the energy to keep going in the twilight years of his life. I met him in '03, at Brunos. He was handing out Lunatic Fringe shirts, and has been a friend ever since. That shirt is 1 of only 5 shirts I own after the storm. I wear it as I type this note. Below is a pm that he sent me, when I informed him of a classmate of his I met in Hattiesburgh, for the Southern Miss series. And those that mind... don't matter. I am very saddened by John's passing. I never had the pleasure of meeting him in person, but I exchanged many emails with him over the past few years. It was always an enjoyable experience to hear his views. He had a wonderful sense of history, and I learned much from him. Above all, he was a Tulanian who loved his university. I shall miss him very much. as I said in an email to his family, John brought a lot of emotion to the table. Sometimes good, sometimes bad, but he was ALWAYS PASSISONATE ABOUT TULANE. He was the first board member that I went out of my way to meet. He and I got together for lunch during baseball weekend at Houston years ago. He was still in good health, and still able to drive, and we had a good time. Later on, he and I disagreed on some things, and it wasn't always nice. However, I will always remember our first meeting, and the kind of passion that he brought to Tulane Athletics. If only we had another 10,000 fans like him, our financial problems would be in the past. I can't believe that the girls and I were just with him a few short days ago. Our visit was one that I will always remember and forever treasure. So glad we did that...so glad. John and I became close friends over the baseball season. Our talks would revolve around the team but eventually they became about the other things that we loved and cared about, family, friends etc. I could always count on him to pray for me or my family. I knew that when he said he was praying for me that it was a fact...not just something he said flipantly. I knew that I had found a friend. What a time we live in when deep friendships can be forged with a mouse and a keypad. I will miss him more than I can know at this moment. When the baseball season begins and he's not online, there will be a great sadness in my heart. I know without a doubt that he is where he's wanted to be for a long time. With his Lord and with his Betty. Thank you John McCutchen for being my friend. I love you. Last of a distinct breed.....80 yrs.+, Tulane grad, staunch Democrat. I am proud to have known him if only via email. Rest John, thou are now where the grass is greenest. Although we never met, I feel as though I knew him well. I know he will always be with the Wave. Although we never met in person that I can recall, John was an inspiration and a good man. We exchanged some PMs that I'd prefer to keep that way concerning children with disabilities. He was a source of good information and hope. God bless John and his family. A great Tulane man, an even better person. Communicated with him a few times via email this past year...I never personally knew him, but I miss him already. Anyone know why he went by attom with 2 t's? i had the great fortune of meeting attom at the tcu game to open the season a coupla years ago , and hung with him at bruno's the night before. a very wise, very charming individual. ANd a great Wave fan. God be with his loved ones. You can win at Tuh-Laine. We went down nere one time n got whupped! The 2003 CUSA baseball tourney and the 2003 football home opener vs. TCU. John's love for Tulane, zest for life and quiet class and dignity will always be remembered by my family. This forum has lost a piece of its heart. Damn...that's really sad news. YOGWF won't be the same without him. John and I had our moments, but I guess that stems from sharing the same passion for TU athletics. In the end, we became, if not close, mutually admirable of each other. I know I admired him for his steadfast pursuit of all that is good for Tulane University. I must say, this comes as a complete surprise. It has been quite a while since I have posted here. I don't come here that often anymore. Even though I never met him in person, John and I would shoot the breeze in e-mails back and forth about Tulane and other things as well. He always seemed to have the right line at the right time. He was indeed an encouraging person. He will be surely missed. At times, when I would seem a little, shall we say "out of order" on this board, he would e-mail me and speak with me as a friend. I just wish that Tulane could have won the CWS this year, so he could have seen Tulane take a title home in his lifetime. With my handle being ATSF_Greenie, the ATSF is for the Atchison, Topeka, and Santa Fe Railway (Now BNSF, Burlington-Northern-Santa Fe), John was able to give me great historic perspective on not only the AT&SF, but railways in general. Being a huge railroad fanatic, I so greatly appreciated his insight. His knowledge on them was fabulous. I always found John's experiences very enlighteneing and encouraging. He had a lot to share and lot to give. Being a Conservative Republican, which I always have been, I would never would have known his affliliation. We never discussed politics. He probably did not know mine either. I guess my biggest regret in all this is I have not spoken to John in a while. It was not on purpose or anything. I guess with the hurricane and all, we all got wrapped in out our lives being so turned upside down. I really regret that I did not get the chance to speak with him at least one more time to let him I know I greatly appreciated his friendship. So in closing, John will be missed indeed. But, you are in a better place, with our Heavenly Father, our Savior, and the Holy Ghost. I have no doubt that they have a special place for you in Heaven, and now you are reunited your beloved wife, never to have to part with her again. Put in a good word for me up there. When my time comes, I hope to see you in person up there. My thoughts and prayers to all of your family and friends. A great man whose life is to be admired and followed. Oh-no....haven't been on the board in a while...how incredibly sad. One of my very favorite posters, and having exchanged some emails over the years since meeting him at Bruno's during the review, I know that he was a sweet and gentle man, die-hard Tulanian, and an inspiration. Oh how he will be missed. I'm not really sure exactly how John and I became friends. All I know is that some time after the CWS I would recieve e-mails and PM's from him explaining that, as in life, following Tulane athletics had its ups and downs. Now, after Katrina and John's death, the CWS is finally in perspective for me. I will miss receiving my bundle of coupons from John for cat food and beauty products. He is the only man I know who could get away with sending me coupons for "age defying" products with a note that said, "best of luck, hope this helps." I think it was because he was Attom/Greenie of YOGWF fame. I will also miss receiving his recipes with notes that said, "maybe you could cook just one night for your husband. If you follow the directions, it should not make him sick." Again, Attom/Greenie was the ONLY guy who could get away with THAT. To say we were very different people would be an understatement. 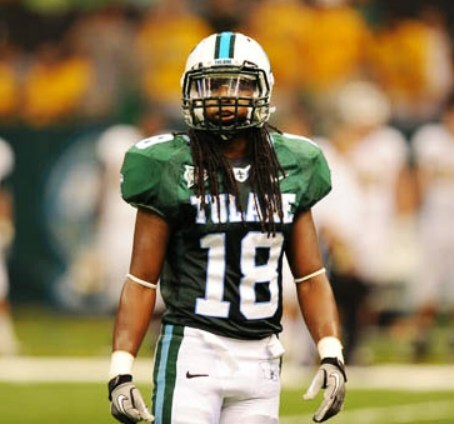 Tulane athletics bridged a gap between age, political views and very different lives lived. But our "conversations" were always spirited and I looked forward to them and now, I miss them more than I can say. I wish I could have met him at a game or at a Conference Tournament. Unfortunately, when I met John, it was to say goodbye. We looked at his old year books and he told stories of Tulane and Betty, his bride. I asked him if he was scared. His response was, "not about what's after, I'm just afraid of getting there." I am relieved that his Lord called for him only days after he said this. I hope he did not suffer. Most importantly, I know he is with Betty and I know that he is happy and at peace. So, for now, I will keep using my age defying products and I will finally make that chicken recipe and think of John. In February, I know I will look up to the sky as the Wave is once again playing ball and know that Attom is there, checking in on all of us and his beloved Tulane. John also e-mailed me from time to time. He was familiar with my wife's cousins, aunts and uncles over in New Roads. One of the warmest and most impressive things he ever did (along with "jogger") was notify the board of the passing of my father in October, 2002...by picking it up in The Advocate's obits online. I was truly touched. I feel blessed to have "known him" by way of this great forum. GO ATTOM! AND GOD BLESS YOU! I am honored to have met him in '03 and my condolences go out to his family and friends. YOGWF has definitely suffered with his loss. I will never forgive myself. I just read this thread and didn't check the obits in the Advocate. There is no way I would have missed the funeral this morining. I can't believe I missed the funeral this morning. The Grace of God was truely with this man.